Have you always wanted to participate in a Rock n Roll Marathon series event but couldn't make it to one of their destinations? Here is your chance to get gorgeous medals while virtually running with some really cool people. The Rock n Roll Marathon Series recently announced "Making a Band", a virtual series of three 5K races you can do anywhere and anytime! If you live in the south, this is a great way to stay motivated during the hot summer months. Making the Band consist of three 5K's during the summer. Guitar Solo, Drum Solo and Lead Singer. If you register for Making a Band you get all three medals and a bonus medal! Start your summer off with a Guitar Solo! Jam out as you rock a 5K from anywhere you want! Get a medal for your run and a personalized finisher zone! Let’s Rock this Run! It’s time for your Drum Solo! Get up and run with your favorite music through a park, on a treadmill, or wherever works for you! Get a medal for your run and a personalized finisher zone! Let’s Start Drumming! Finish your summer with an epic 5K Run! Whether you are headed back to school or back from vacation, rock this run! Get a medal for your run and a personalized finisher zone! Belt out this run! Want to make your own Rock ‘n’ Roll track? 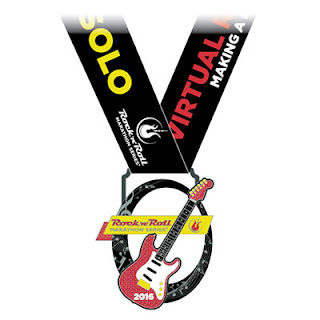 Register for the Rock ‘n’ Roll Virtual Run- Making a Band for $99 and run all three races and you’ll get a 4th Bonus Medal! Run with friends, on a treadmill or with your local running group. You’ll receive all 3 medals and a bonus 4th medal for Making A Band! If amazing medals weren't enough, here are a few other reasons you should participate in the Rock n Roll Marathon Series Virtual Race. Win Prizes! Share your runs using #RnRVirtualRun for a chance to win awesome prizes and entry in to a Rock ‘n’ Roll event!